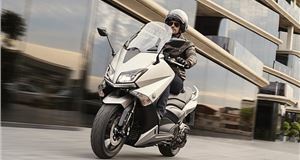 Honda has given its Forza 300 more than just a makeover, this is a very different approach from the previous model. Where the old scooter had a laid-back seating position and overall attitude, this new one is much more up and at ’em. This shows in the way the weight has been shed from the Forza and how the remaining mass has been moved forward to give better handling. Another consequence of all these updates and changes is the Forza is now a more practical proposition, which should help boost sales from the lacklustre numbers the old version managed. 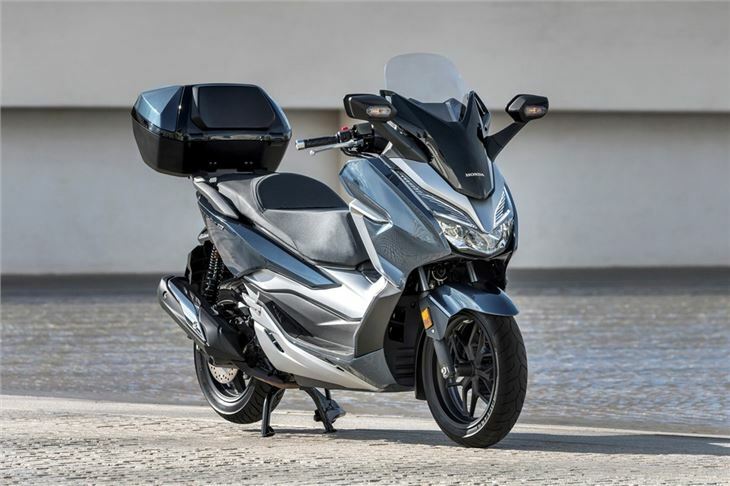 With more under-seat storage, a classy fresh look and more pep from the engine than you might expect, this is Honda’s considered retort to its rivals. There are several factors that make this latest Forza a much better, more able scooter than its previous incarnation ever was. 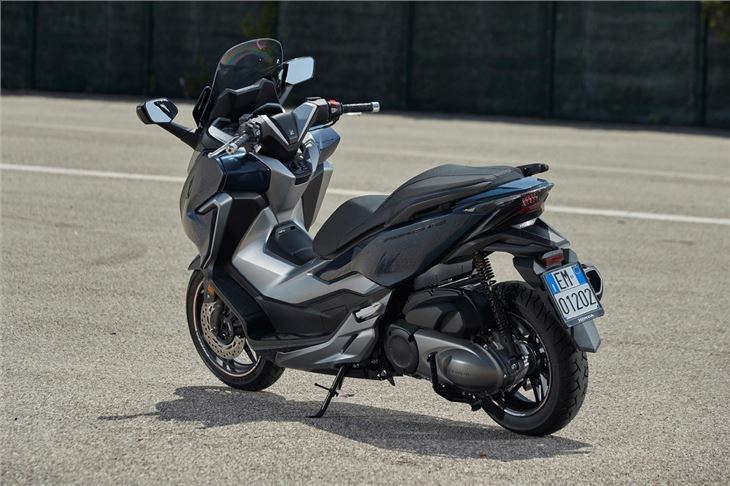 Prime among them is the shedding of weight from the bike, which now sits 12kg lighter on the road than the old model. Put that together with the steeper steering head angle and it makes the Honda a much sharper ride. This has clearly been the intention all along for this comprehensive update of the Forza as Honda has also made it 26mm shorter and the wheelbase has been truncated by some 35mm. It provides a surprisingly sporty set-up and feel to the Forza that you don’t get in many of its rivals. 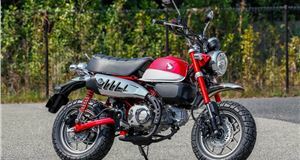 Yet this is no edgy urban toy for yoofs on L-plates as the seat is now 64mm higher. Not ideal for some shorter legged riders, but it gives most a greater sense of control over the machine. Getting on and off the Forza is no problem despite the higher saddle height as you just step through the frame. Shorter riders can perch towards the front of the seat, while taller riders have enough space to accommodate lankier occupants. The only time this might become an issue is in bad weather when the longer framed rider might have to crouch a little to feel the benefit of the front screen. 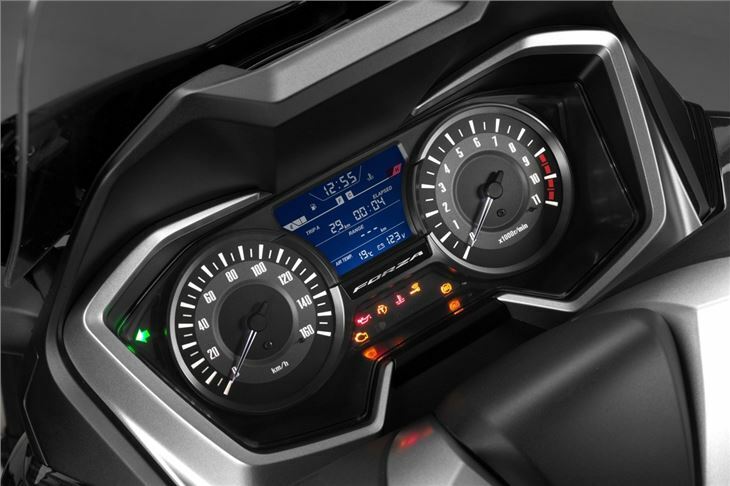 In the plus column, Honda now provides an electrically adjusted screen as standard and it moves up and down very briskly at the touch of a button. It makes it a doddle to fine tune the screen’s height to your stature and it did a fine job of keeping us dry during our time on the Forza. There’s also a new LCD dash nestled under the screen that’s clear to read in the day or at night. 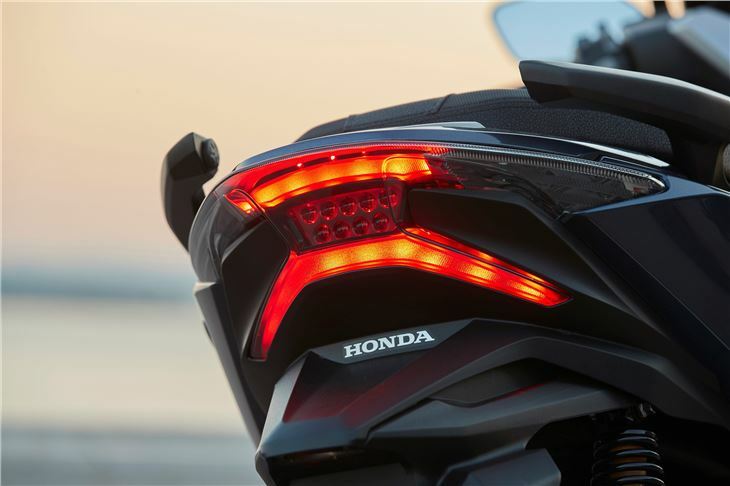 All of the other controls are typically thought out in the way we’re used to from Honda. Maybe not the most attractive switchgear to look at, but there’s no doubt everything works slickly and will keep on doing so for a long time to come. 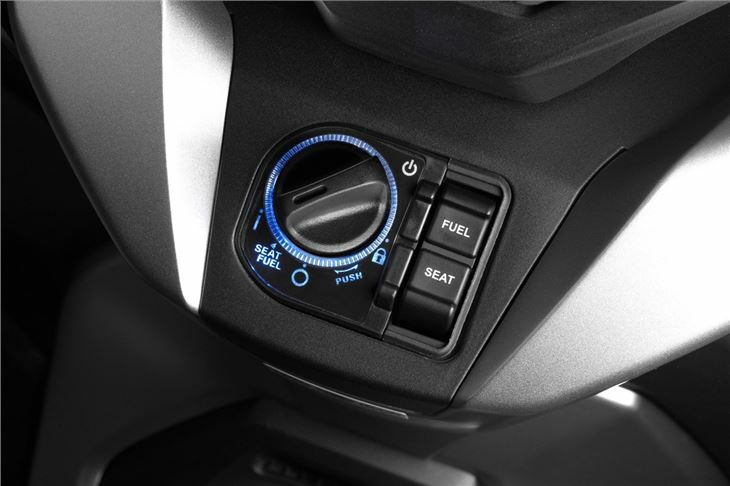 Part of the button selection includes the Honda Selectable Torque Control traction assist system. 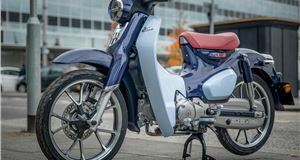 Some may wonder why a 25PS scooter needs this addition, but with a 14-inch rear wheel and slippery roads, we’re more than happy to have it there as a safety net between us and toppling off unceremoniously. 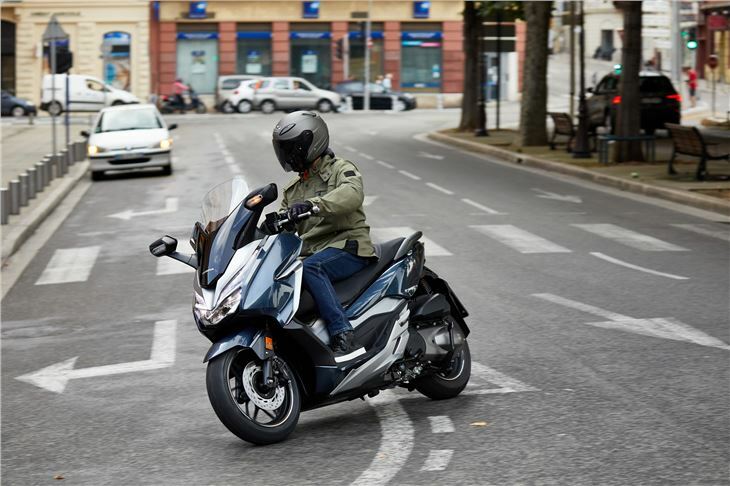 The 25PS is generated by the same 279cc fuel-injected single-cylinder motor as found in the SH300i, so it’s well proven and easy to live with. For this latest Forza, Honda has tweaked the CVT (continuously variable transmission) settings so there’s more mid-range urgency when you open the throttle. It gives a crisper feel to the Forza and makes it much more reactive when you want to accelerate away from encroaching traffic. 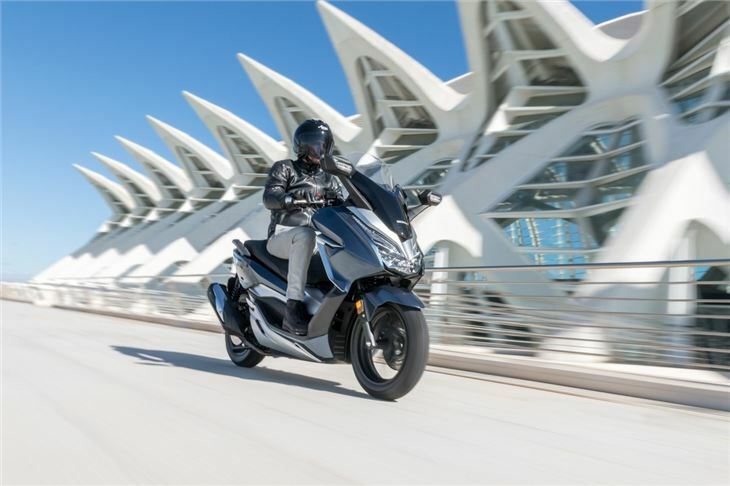 The economy is another strong suit for this engine as it turns in a combined consumption of 88.4mpg according to Honda. 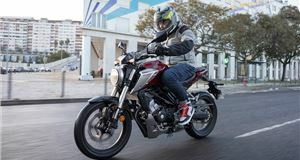 With an 11.5-litre tank, that means stints of up to 200 miles between fills, which is better than a Yamaha V-Max can offer. 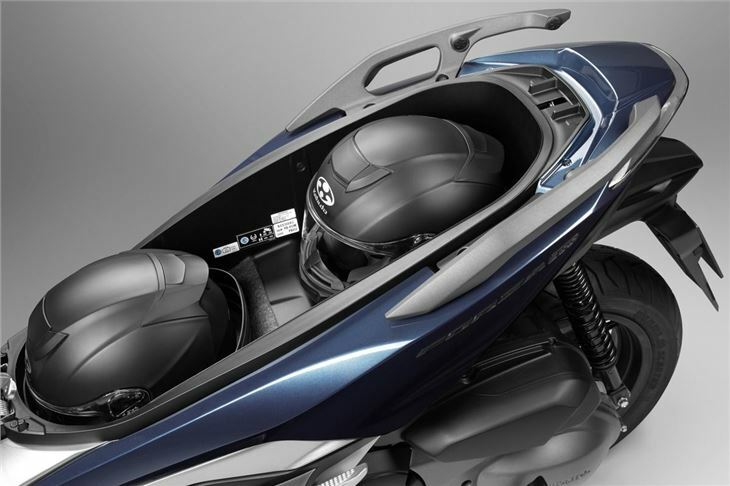 Another capacity that has improved is the under seat storage, which has grown to 53.5-litres from the old model’s 48-litres. Fitting a pair of full-face helmets in here is quite possible and it means there’s loads of room for shopping. Nipping to the supermarket will be one of the duties the Forza 300 owners will use this scooter for regularly. Not just because of the load space, but also because it offers a smooth, comfortable ride quality that will keep your damson jam jar intact. 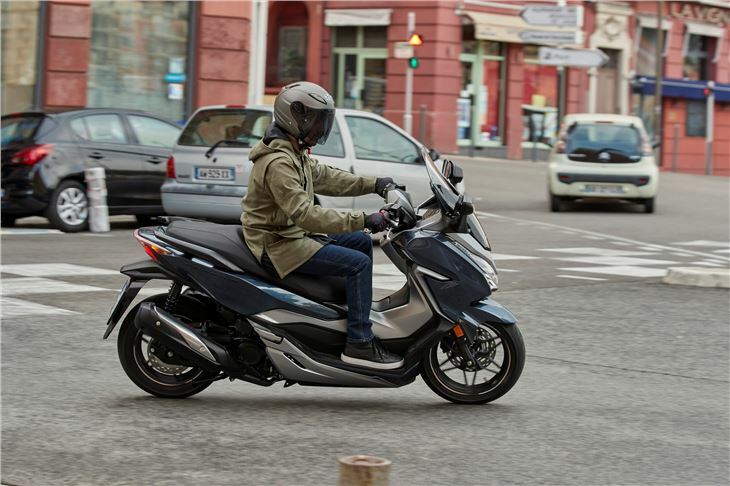 Compared to most in this class, the Honda soaks up the heinous surfaces of most urban streets with composed control. It steers quickly to avoid potholes and brakes efficiently thanks to ABS anti-lock-equipped discs front and rear. Our only gripe here is the rear brake can be subject to the ABS cutting in earlier than we’d expect. Honda has seriously upped the Forza’s game with this all-over remake. 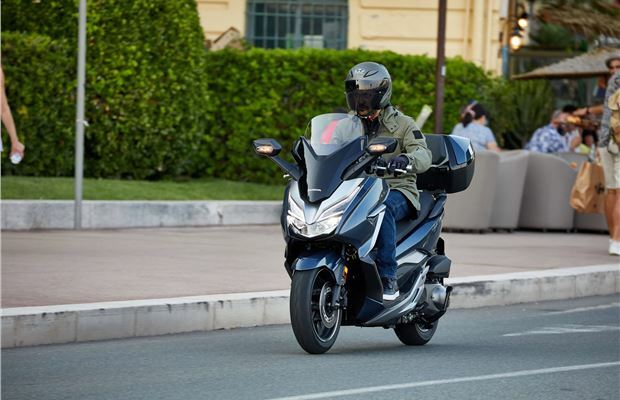 It’s turned a competent but dowdy scooter into one that’s very desirable based on looks and ability. 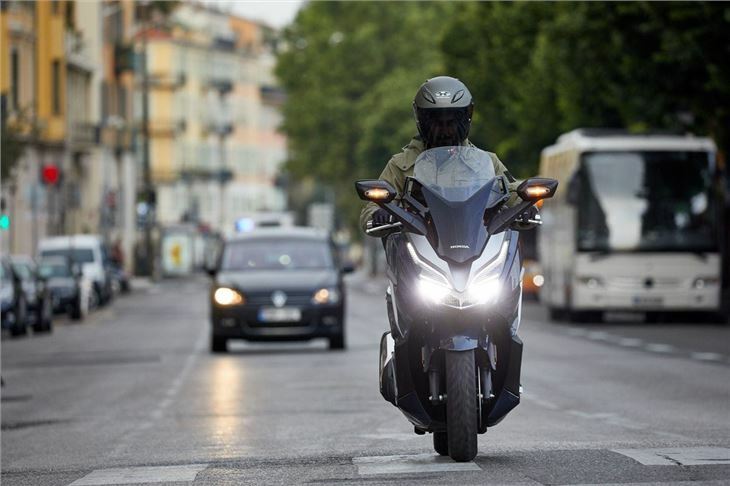 There are lots of upmarket features, such as the keyless ignition and selectable torque traction control system, plus all of the basics are spot on. 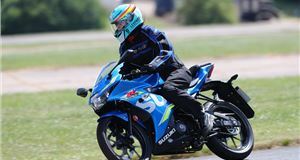 The Forza 300 is also priced at exactly the right point to give its key contenders pause for thought by being slightly cheaper than many. For the depth of quality and practicality bundled together in the Forza, it’s a strong shout for being best in class. Performance: Top speed 80mph. Fuel consumption 88.4mpg (claimed). VED £42.